Part 1 Smart sensors for industrial applications: What makes sensor devices and microsystems ‘intelligent’ or ‘smart’? Direct interface circuits for sensors; Capacitive sensors for displacement measurement in the sub-nanometer range; Integrated inductive displacement sensors for harsh industrial environments; Advanced silicon radiation detectors in the vacuum ultraviolet (VUV) and extreme ultraviolet (EUV) spectral range; Integrated polarization analyzing CMOS image sensors for detection and signal processing; Advanced interfaces for resistive sensors; Reconfigurable ultrasonic smart sensor platform for nondestructive evaluation and imaging applications; Advanced optical incremental sensors: encoders and interferometers. Part 2 Smart micro-electro-mechanical systems (MEMS) for industrial applications: Microfabrication technologies used for creating smart devices for industrial applications; Microactuators: Design and technology; Dynamic behavior of smart MEMS in industrial applications; MEMS integrating motion and displacement sensors; MEMS print heads for industrial printing; Photovoltaic and fuel cells in power MEMS for smart energy management; Radio frequency (RF)-MEMS for smart communication microsystems; Smart acoustic sensor array (SASA) system for real-time sound processing applications. Smart sensors and MEMS can include a variety of devices and systems that have a high level of functionality. They do this either by integrating multiple sensing and actuating modes into one device, or else by integrating sensing and actuating with information processing, analog-to-digital conversion and memory functions. Part one outlines the industrial applications for smart sensors, covering direct interface circuits for sensors, capacitive sensors for displacement measurement in the sub-nanometer range, integrated inductive displacement sensors for harsh industrial environments, advanced silicon radiation detectors in the vacuum ultraviolet (VUV) and extreme ultraviolet (EUV) spectral range, and advanced optical incremental sensors (encoders and interferometers), among other topics. 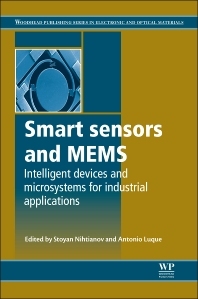 The second part of the book describes the industrial applications of smart micro-electro-mechanical systems (MEMS). Some of the topics covered in this section include microfabrication technologies used for creating smart devices for industrial applications, microactuators, dynamic behaviour of smart MEMS in industrial applications, MEMS integrating motion and displacement sensors, MEMS print heads for industrial printing, Photovoltaic and fuel cells in power MEMS for smart energy management, and radio frequency (RF)-MEMS for smart communication microsystems. Smart sensors and MEMS is invaluable reference for academics, materials scientists and electrical engineers working in the microelectronics, sensors and micromechanics industry, and engineers looking for industrial sensing, monitoring and automation solutions. Stoyan Nihtianov (M’93-SM’98) received his M.Sc. and Ph.D. degrees in electronics from the Technical University in Sofia, Bulgaria in 1980 and 1987. From 1987 till 1995 he was part of the Dept. of Electronics, Technical University - Sofia, where he was an associate professor involved in research and teaching on analogue circuits and smart sensor systems. Dr. Nihtianov is a member of the technical program committees of: International Conference on Industrial Technology (ICIT), International Symposium on Industrial Electronics (ISIE), International conference “Electronics” (Bulgaria). He is an AdCom member and serves as a chair of the technical committee on MEMS@Nanotechnology of the Industrial Electronics society. He is also an associate editor of the IEEE Sensors Journal, and serves as an officer “Industrial relations and conferences” of the BeNeLux section of IEEE. Antonio Luque received the M.Sc. and Ph.D. degrees in electrical engineering from the University of Seville, Seville, Spain, in 2000 and 2005, respectively. He currently holds the position of Associate Professor in the Department of Electronics Engineering, University of Seville. His research interests include microﬂuidics, inertial sensors, BioMEMS, and polymer microsystems. Dr. Luque was the Chairman of the IEEE Industrial Electronics Society Technical Committee on MEMS and Nanotechnology in 2008–2009, and member of the IEEE JMEMS Steering Committee during 2013. He was a recipient of the Burgen Scholarship from the Academia Europaea in 2007.